Happy July 4th out there to my USA friends! I want to thank you all for your kind comments yesterday regarding my tooth. This weekend has turned out to be pretty awful. There have been some other family things go on this weekend that made things more difficult. Between that and my tooth stuff this weekend has been pretty well....crappy. Bleh. I don't mean to be a downer really, but I can't pretend to be all happy and cheerful when that isn't really how I'm feeling. Everything will be fine though just stressful. No worries :D Nail polish cheers me up. 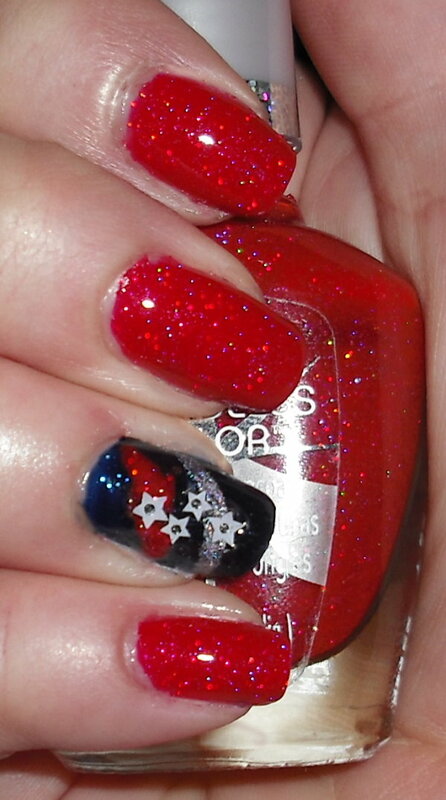 Anyways here is my July 4th Franken Mani! I used my red holographic glitter franken called "Firecracker" (1/2 bottle of Pure Ice Siren & 1/2 a bottle of CoverGirl City Lights), my Essie Starry Starry Night franken, China Glaze Sexagon, & Nailene stickers. I LOVE it! Happy 4th to you! looks good! your nail art is much better than mine lol ... happy 4th! When I was a kid my dad's best friend always had a big party for the 4th of July, with a pool too! And we would light off tons of fireworks and argue with the neighbors about whose fireworks were better. It was so much fun. My dad and his friend don't talk much anymore and it's been 5 or 6 years since I went to their house. Now I don't light off fireworks and I just go to a fireworks show over the bay where I live instead. Oohh pretty and sparkly. Very nice. ooh la la, love the index finger and the franken red! Tanya- I loved your nail art! I loved the sparkles! just wanted to say: you have one of the best SSN dupes ever! Beautiful mani! I love it. Hope you have a better week to make up for your bad holiday weekend!